By the Spring of 1916 those "Second Line" Territorial units had become efficient fighting formations, and it was decided to despatch them to reinforce the armies in France and Flanders. The "Second Line" of the original South Midland Division had by then been designated as a distinct formation—the 61st Division—and during May that Division was placed under orders. 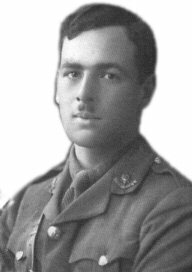 The 2/7th Worcestershire left Tidworth on 22nd May 1916 for Southampton en route to France. 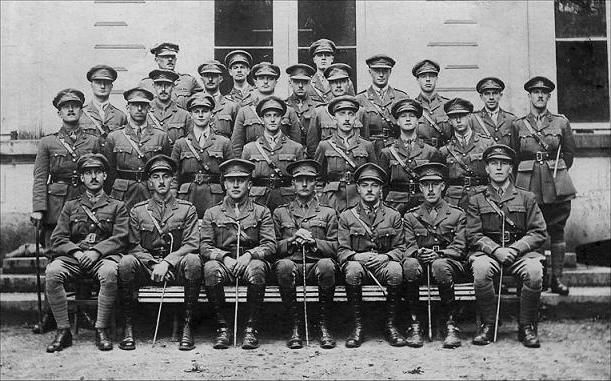 At the end of May 1916 two other Battalions of the Regiment had joined the British Armies in France. The training of the 2nd-Line Territorial units of the South Midland Division had been completed, and their Division, newly entitled the 61st Division, commenced the crossing to France on May 22nd. The 2/7th Worcestershire entrained at Tidworth on the afternoon of 23rd May 1916 and embarked that evening at Southampton. At 6 p.m. the S.S. "Cesarea" steamed down Southampton Water and out into the Channel, but at midnight an alarm of submarines compelled the troopships to return to Southampton. Not till after dark on the next night did the transports sail again. At dawn next morning (May 25th) they reached Havre and the Battalions disembarked. Lieut.-Colonel L. C. Dorman (commanding officer), Major E. H. Grainger, Major G. H. Green, Captain & Adjutant F. D. Simpson. Captains: W. E. Boucher, C. L. Butcher, E. R. Hopewell, G. S. Tomkinson, W. Hancocks. Lieutenants: G. A. Thompson, E. C. Hemingway, H. Goodwin, K. S. Hemingway, J. E. Roberts, A. H. Bowman, S. H. Spreat, A. O. G. M. Grove. Rev. J. W. S. Tomlin (C.F.). 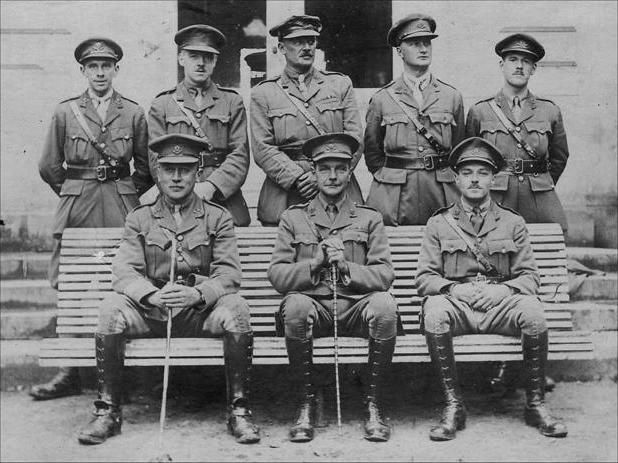 Front row seated L to R: Major G. H. Green, Lieut.-Col. L. C. Dorman, Major E. H. Grainger. That night the 2/7th Battalion rested at a camp at Havre before moving the next day (May 26th) by train to Berguette and then marched to Robecq. After a few days of inspections and preliminary training, orders & came that the 183rd Brigade would be attached for instruction in trench warfare to the 35th Division. On the last day of May, the 183rd Brigade marched forward from Robecq through Le Cornet Malo to Vieille Chapelle. There the 2/7th Worcestershire went into billets. Then on the 1st of June the two Battalions marched forward to the line. The individual companies of the 2/7th Worcestershire were attached to the battalions of the 104th Brigade (17th, 18th and 20th Lancashire Fusiliers and 23rd Manchesters) at Richebourg St. Vaast. On June 10th that period of instruction came to an end the 2/7th Battalion was concentrated at Vieille Chapelle. On the following day the 61st Division moved forward to take over the Neuve Chapelle sector of the line from the 38th (Welsh) Division. The 183rd Brigade took over the line by the Moated Grange with two battalions in front line. The 2/8th Worcestershire held the right hand sector, including the "Ducks Bill". -The 2/7th Worcestershire were in support at Pont-du-Hem. The 2/8th Worcestershire held the front line for four days, experiencing some minor fighting. Then on June 15th the Battalion was relieved and went back into billets at Riez Bailleul. Next day the 61st Division extended its front to the right, and the 183rd Brigade had to bring a third battalion into line. The 2/7th Worcestershire took over the trenches facing the Bois du Biez and held them (casualties 4 wounded) until June 21st; then, the 183rd Brigade moved back into Divisional Reserve. The 2/8th Worcestershire, marched back to La Fosse, while the 2/7th Worcestershire, went into billets at La Gorgue. The two Battalions remained in those billets until the end of the month. Lt. Stanley Charles Booker M.C.